Figure 3-42.Methods of measuring pipe and tubing. Home > Construction Training Manuals > Utilitiesman Volume 01 > Figure 3-42.Methods Of Measuring Pipe And Tubing. Figure 3-42. - Methods of measuring pipe and tubing. After cutting the copper, remove the burr inside the cut with the reamer on the tubing cutter. 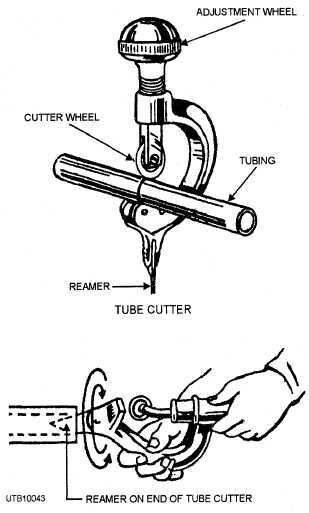 Place the reamer in the end of the copper, and revolve the tubing cutter clockwise until the burr is removed. Figure 3-43. - Cutting and reaming copper tubing. it can be held in a threaded fitting when a line joint is being made. Before a flare is made, slip a flare nut on the copper. A common error is forgetting to put the nut on before making the flare. For additional information on making flared connections, refer to Use and Care of Hand Tools and Measuring Tools, NAVEDTRA 12085. Figure 3-44 shows a few typical copper fittings. A sweated joint is made with solder instead of threads or flares. When making a soldered joint with a sweat fitting, clean an inch or more of the end of the copper tubing with steel wool or 000 sandpaper until new metal appears. Clean the inside of the fitting in the same manner. Spread a thin film of paste flux on the tube end with a clean brush or applicator. Do not apply paste with your finger or an oily applicator. Carefully insert the copper into the fitting to make them fit together very closely. Capillary action must spread the solder evenly and completely over the surfaces; however, the process is not effective with loose fits because of excess clearance. If the fit is loose, you may have to tin the end of the copper tube.